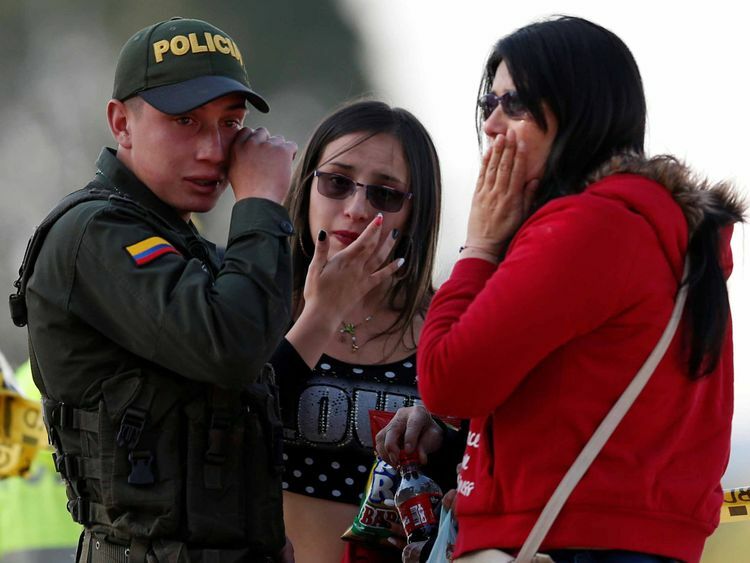 BOGOTA: Colombia' s government declared three days of mourning Thursday after at least 21 people died in a car bomb at a Bogota police cadet training academy, and 68 were wounded - the worst such incident in the city in 16 years. The defense ministry said the "terrorist act" was carried out using a vehicle packed with 80 kilograms (around 175 pounds) of explosives. "Unfortunately, the preliminary toll is 21 people dead, including the person responsible for the incident, and 68 wounded," Colombian police said in a statement, adding 58 of those injured had been discharged from hospital. The defense ministry had previously reported 11 dead and 65 injured. "All Colombians reject terrorism and we're united in fighting it," President Ivan Duque tweeted in the aftermath. "I have also requested that priority be given to all the investigations ... to identify the masterminds of this terrorist attack and their accomplices," he said. The bomber - who authorities confirmed was killed in the attack - struck at the General Francisco de Paula Santander Officer's School in the south of Bogota during a promotion ceremony for cadets. No group has claimed responsibility, but public prosecutor Nestor Humberto Martinez named suspect Jose Aldemar Rojas Rodriguez as the "material author of this abominable crime." He said the truck underwent an inspection in July in the Arauco department on the border with Venezuela - a traditional stronghold of ELN Marxist guerrillas. "The brutal act of terrorism in Bogota took the life of a compatriot," Moreno said on Twitter. "My sincerest thoughts go to the family, friends and companions of Erika Chico." Fanny Contreras, the Colombian armed forces' health inspector, told local radio that the truck "entered (the school compound) suddenly, almost hitting the police, and then there was the explosion." "In two years since he joined the police, he's never had to face a situation like this," she said. United States assistant secretary of state in charge of Latin America, Kimberly Breier condemned the attack and said: "Our condolences and sympathies go to the victims and family members of those killed." The US embassy in Bogota offered its "help in investigating this reprehensible attack." "When we turned to look at the school the sky was grey with smoke. People were running, sirens... horrible, horrible, it seemed like the end of the world," Jimenez told AFP. Peace talks with ELN guerrillas - who in the past have claimed responsibility for bomb attacks on police - stalled before Duque replaced Juan Manuel Santos as president, and have not been restarted. In June, three people - including a Frenchwoman - were killed and nine others wounded in an attack on a Bogota shopping mall that authorities blamed on a fringe left-wing group called the Revolutionary People's Movement (MRP).